CHARLESTOWN NEVIS (October 15, 2010) — Minister of Agriculture in the Nevis Island Administration [NIA] the Honourable E. Robelto Hector joined representatives from the Department of Agriculture earlier this week in the donation of food items to a handful of the island’s residents. The food donation exercise was just one of the many activities planned by the Department of Agriculture to commemorate World Food Day [October 16th]. 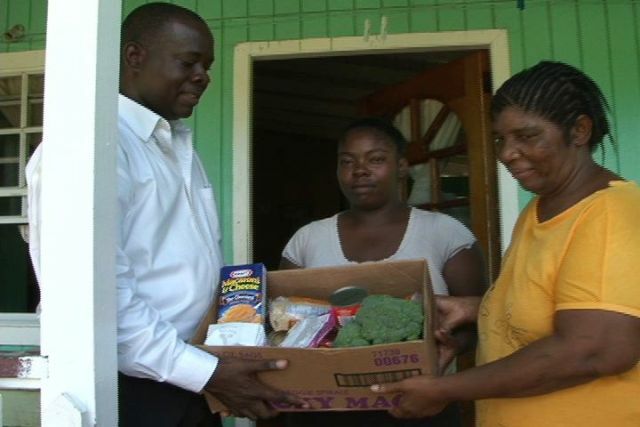 Minister Hector, who spends a vast amount of his time educating persons on the importance of eating healthy, made the first food donation to a member of his constituency, Ms. Imelda Clarke. “We know that there is a global thrust by the Food and Agricultural Organisation [FAO] to make sure that that the meals are balanced [and] to make sure they are nutritious. It [FAO] is also an organisation that highlights the plight of what is happening in the world and the need for us to eat properly at this time so that we don’t have problems in our later years,” Hector said as he spoke about the importance of eating healthy. The minister also offered words of commendation to the Department of Agriculture for what he described as “a good effort” to aid in the fight against hunger. Clarke, who resides in the village of Craddock Road, told the Department of Information that she was extremely grateful for the donation and she used the opportunity to wish Minister Hector, his ministry and the Department of Agriculture a happy World Food Day. Director of Agriculture Mr. Keithley Amory said he was grateful to Rams, Best Buy and Bargain House supermarkets as well as the Government Supply Office and members of the general public for their contributions. The food recipients were selected by the Social Services Department then submitted to the Department of Agriculture.